I’m cat-sitting in Williamsburg, Brooklyn for the next couple weeks – which is great because not only do I get to play with cuddly kittens, but I also get to try new veggie burgers! First stop: just a block away from the aforementioned adorable kittens… Foodswings. They describe themselves as “Vegan Fast Food”. 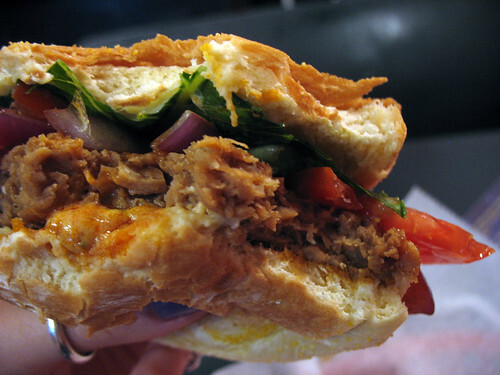 I was curious to see how this compared to the other fast-food-esque vegan restaurant that I have tried: Kate’s Joint. Foodswings is really more like a fast food takeout place than a sit-down restaurant. There are plenty of tables and two booths, but there was only one other person eating when I came in (around dinnertime on a weeknight), although I saw orders being delivered and people coming in to pick up orders they had called in. I took a look at the menu – ten different burgers to choose from! All vegan! The guy behind the counter recommended the “buffalo burger”, which was the one I had been leaning towards anyway – “Soy Burger w/ Buffalo Sauce, Bleu Cheese, Lettuce, Tomato & Red Sauce”. Mmmm. Now, that soy patty… it’s essentially the same as all the soy patties I’ve ever bought in the frozen food section. That hockey-puck shape, ambiguous brown fibrous texture that one can only assume is meant to imitate meat, etc. However, to give Foodswings credit where credit is due, they took that boring patty and drenched it in a delicious hot sauce. Which was complemented perfectly by the vegan bleu cheese. I found myself truly enjoying each bite, even though at first I was put off by the disappointing patty. The lettuce, tomatoes, and onions were all crisp and fresh, too. The bun was pretty standard, nothing special – it fit with the “fast food” theme perfectly though. And it was soft, not even slightly stale! (honestly, I’ve had so many starting-to-go-stale buns that I really do notice when a restaurant goes the “extra mile” and serves me one that’s actually fresh). The burgers don’t come with any sides, but they offer the option of adding a small order of fries for only a dollar extra, which is reasonable enough that I forgave them for being "one of those" annoying restaurants that insist on not including fries with their burgers. Not bad for a fast food place. Not as mind-blowing as Kate’s, but very satisfying. The other burger options on the menu all sounded pretty good too, as did the plenty of non-burger items. I picked up a vegan peanut butter whoppee pie from the dessert case on my way out, to eat later (and it was delicious). 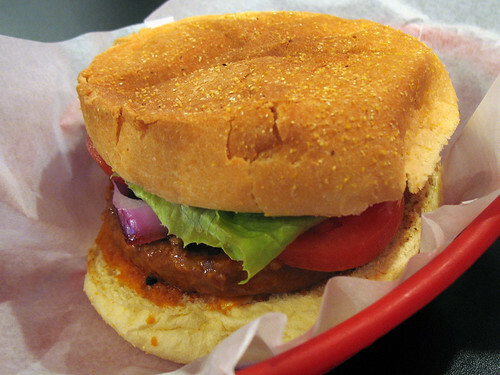 Does anyone have any recommendations for other veggie burgers in Williamsburg? I have my own list of places to check out, but could always use more suggestions. Addendum: I later tried one of their vegan milkshakes, and it was AMAZING. I highly recommend that you order one if you are eating there! Oooh yum! I love the idea of a buffalo burger. I, too, am diasppointed by the standard frozen patty when I order a burger in a restaurant (though I don't mind eating them at home). But dressing that patty up is key to making it stand out. You've got to do the drumsticks too.